Malala Yousafzai won a Nobel Peace Prize on Friday for her "struggle against the suppression of children" and her commitment to children's rights around the world. After surviving life-threatening gunshot wounds to the face by the Taliban almost exactly two years ago, the 17-year-old Pakistani girl took her fight for peace and gender equality to the world stage. She created the Malala Fund, which aims to empower girls everywhere through education. 1. Malala became a global voice for the Nigerian girls abducted by Boko Haram. Malala met with Nigerian President Goodluck Jonathan in July to raise awareness for the injustice, the Associated Press reported. She urged Jonathan to meet with parents of the 219 schoolgirls kidnapped by terrorist group Boko Haram, and further his commitment to bring the girls home safely. "My birthday wish this year is 'Bring Back Our Girls' now and alive," Malala said. 2. Malala helped Syrian refugee children cross the border to safety. In February, with help from her father, Malala and other team members from her fund helped hundreds of Syrian refugees leave their war-torn country behind and enter the safety of Jordan. When asked about the risks of danger aiding those refugees in need, Malala told CNN, "It's a risk to all of us if we ignore them." 3. Malala helped young people have a voice among world education leaders. The Global Partnership for Education, which works in low-income countries to ensure basic education for all, announced in June that a grant from the Malala Fund would support a first-ever youth delegation at a world education conference in Brussels. 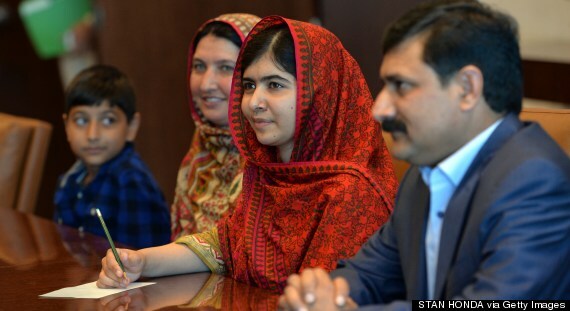 "I believe all countries can do more," Malala said, according to the organization. "Rich countries must do their part and keep their promises, and developing countries must give more of their own budgets to education." 4. The Malala Fund made a long-term commitment to girls' education at CGI. At this year's Clinton Global Initiative, Malala announced that her fund is pledging a $3 million multi-year commitment, in partnership with Echidna Giving, toward education in developing countries, according to ABC News. Some of those funds will go toward a girls' education summit this December. 5. Malala's fight for literacy reached her mom. Malala's global message on education became even more personal when the human rights advocate said her mother had learned how to read and write in August. "Our family shows an example to the world how things change with the help of awareness … and with the help of the importance of education," the 17-year-old said. "My father has also realized that his only job isn’t only to earn money, but also help the family." There are several ways you can help Malala continue her mission when it comes to educating our youth. Learn more here.